Recruitment 2018. Candidates who are having Commerce Degree or CA/ICWAI/M.B.A Finance qualification they can apply online for this NHAI Young Professional Vacancies. Last date to apply online is 11-12-2018. Contract period is 2 years for this NHAI Young Professional Recruitment 2018. Candidates selection will be based on written exam or interview. Preference will be given to the candidates who are having experience in Public Sector or Government organization or institutions. 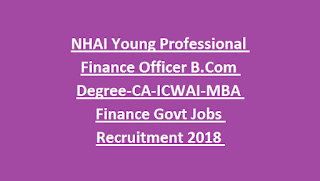 Detailed information about this NHAI Young Professional Finance Officer Recruitment 2018 Notification is updated below. Last date to submission of application form online is 11-12-2018. There are total 70 Young Finance Professional vacancies in this NHAI recruitment 2018. 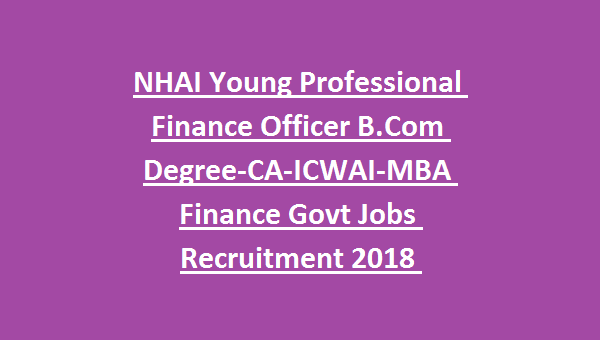 B.Com or Commerce Degree or CA or ICWA or MBA Finance qualified candidates are eligible for applying this NHAI Young Professional Finance vacancies recruitment 2018. Upper age limit is 32 years for this NHAI Finance Officer jobs recruitment as on 11-12-2018. Selected candidates will receive Rs.60000/- per month. Contract period is 2 years for this NHAI recruitment of Finance Officer jobs. It may be extended to one year based on candidates performance. Candidates selection will be based on written exam or interview for this NHAI recruitment 2018. Those who are having commerce degree or CA or ICWA of MBA Finance qualification they can apply online before the closing date of 11-12-2018. Official website to apply online is www.nhai.gov.in.